(Raise Giant Frogs Records) Taking full advantage of their name they inject sound clips regarding birdwatching between tracks. The music isn’t bad, just some good straight ahead rock with a bit of indie around the edges. They lyrics can be a bit trite at times with forced emphasis on words to match the music rather than make a point. Overall they have more hits than misses and I didn’t hear a fully throw away track on the disc. 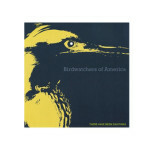 I think Birdwatchers of America will only get better as time moves onward.